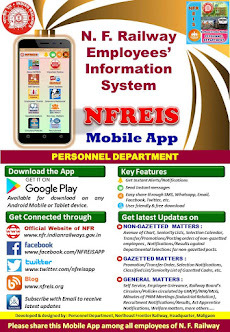 N. F. Railway Employees Information System (NFREIS) is a mobile app, available for download on any Android Mobile or Tablet. 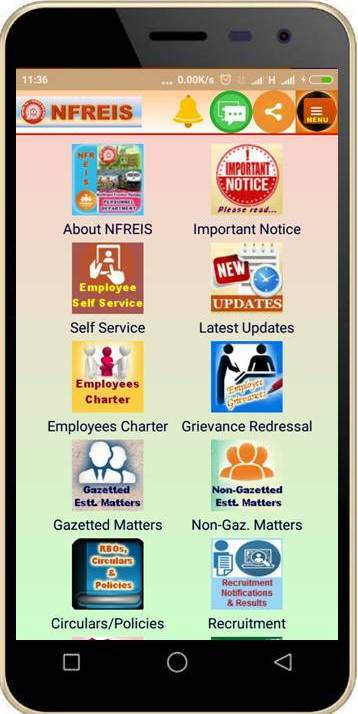 Please share this mobile app among all employees of N. F. Railway through SMS, Email, Whatsapp, Facebook, Twitter, Google+ etc. so that all employees can get quick and easy access of staff related information on their mobile device. Railway Officials of Northeast Frontier Railway aware and updated on various information on Establishment Matters viz. Policy Circulars issued by Railway Board, Schedule of Power, Welfare Activities, Staff Grievance Redressal, Seniority Lists, Selection/ Suitability Calendars, Selections/ Recruitment Notifications, Transfer/ Promotion Orders, Training, etc. This mobile app also contains important information published on the webpage of Personnel Department of N. F. Railway - (www.nfr.indianrailways.gov.in) and other websites related with employee matters viz. AIMs portal, website of Railway Board, ARPAN portal, CPGRAMS portal, NIVARAN portal. This app will help the employees to get all the employee related information in a single click on their mobile device. Notifications and important messages can be sent directly to users through this application. 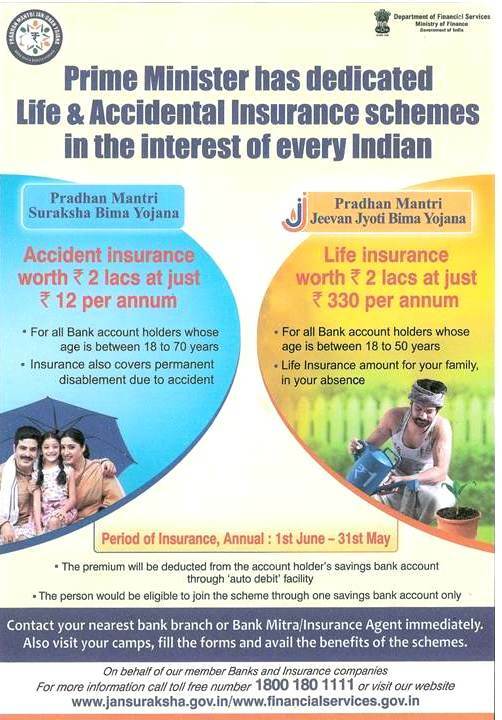 This is a very useful way of communication to send news and important information to employees. All updates are on real-time basis. If any changes are done in the application, for example, change in the design, addition of sections, information, etc., there is no need to reinstall the application. Changes in the application will be seen automatically when the application is re-opened or on re-run. 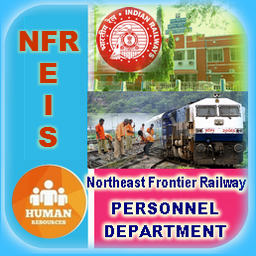 The download link is also available on the website of www.nfr.indianrailways.gov.in (webpage section of Personnel Department). The download link can also be shared through SMS, Email, Whatsapp, Facebook, Twitter, etc. using the share button. Please note that when you download the app, a security alert may be displayed on your Android device. This alert is normal and is shown on most Android devices when an app that isn't published on Google Play Store. For any suggestion, please give your valuable feedback to improve the application to meet the aim and purpose of the application.